Rapid Balls Review: Dead or still Operational? 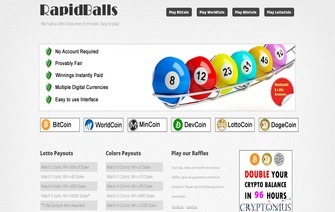 RapidBalls.eu, which was first established online around August of 2013, served as a Bitcoin lottery style of game and was first announced as a beta program for players that specifically used a Testnet3 setup with their interaction with Bitcoin. As this did not bring the required amount of interaction with the site that the owner had originally planned for, the owner announced that he would provide a test amount of Bitcoin for the first 50 players who had signed up. After assuming this would create more buzz around RapidBalls, the owner then started to release different styles of draws, but ultimately the RapidBalls project did not gain enough traction to keep a sustainable gaming site running, although it can still be found online today. As RapidBalls was first introduced to the Bitcoin gaming community, it was a very simple site that only offered one style of draw, which consisted of picking six numbers that ranged from 1-49 and had a subsequent payout for each number that had been matched out of the particular draw. To enter the draw, a player would pick the six numbers that they so desired and proceed to send the amount of Bitcoin they wanted to wager, to a unique address and if the player won, they would receive the winnings back to the address they sent it from. In theory, this seemed like a great setup until a player did a little research to find out that some payouts did not seem to have been realistic, when matched with the site set-up. For the most obvious example, the lack of player interaction clearly proved that the site was unstable from the start. In order for the winnings to be paid that were listed on the site (some up to 5000x the wager) player interaction was key to providing those winnings and as time went on, less and less transactions were being sent, until it came to a complete halt. The owner, at that point, decided that they would introduce more ways to play and more frequently, as the original set-up was timed to be a draw every hour. Around December 2013, Rapidballs added new variations to the game such as: Colors, Total, and a Lucky payout. This seemed to add nothing as far as player interest within the gaming site and appeared to be the owner’s last ditch effort in order to gain some traction for the site, but accomplished nothing in that regard. Price of Bitcoin, at the time, was at an all-time high so as one last attempt of having the site be more accessible and playable, Rapidballs introduced four alternative cryptocurrencies as a method to deposit, in January and February 2014. The subsequent result of this was also a failure and gained no traction as far as site traffic was concerned. As of April 2015, Rapidballs.eu is still online as far as it comes to being an accessible site with a valid URL, but it is safe to say that due to the lack of player interest and the owner’s disappearance from any public comments, through the Rapidballs Twitter page or forums, that the site is no longer functioning. To test this, we actually participated in an instant draw, won, and were supposed to receive 50% of our .0005 stake as the payout chart had indicated but no payment came. When we checked with the statistics of the site, the bet never even came through as being processed. In turn, we decided to send in an email to the support address and much to our expectations, at this point, no response has been returned. If by chance we do receive correspondence, we will update this review to reflect that but it should be evident that players wanting to play or interact with Rapidballs will need to find a more reliable option, if wanting to play a lottery style of Bitcoin game. Bonus Each day at 18:00 server time, a lucky visitor will be awarded 0.0002BTC.